It’s funny how hearing one word or phrase makes you think of another. A friend’s Facebook status started with, “Me Gone Wrong in Spades”. She went on to describe a series of unfortunate events that together made for a pretty crummy visit to the coffee shop. But when I read in spades, I thought of the phrase, “everything’s coming up roses.” I mixed these two phrases briefly in my brain, and thought that in spades was only used in reference to something wonderful. And this friend’s day was anything but wonderful. So I researched the phrase. And indeed, in spades refers to anything in abundance. It could be something wonderful like roses or good luck or it could be something less than wonderful, like spilling a full cup of coffee in a crowded coffee shop. When I think of in spades, I associate it with cards. 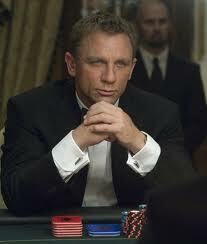 And when I think of cards, I think of Daniel Craig as James Bond in Casino Royal…of course. According to the UK phrase finder, some believe “this expression derives from the imagery of digging with spades and that ‘in spades’ is just short for ‘in spadefuls’.” But it goes on to say that’s not the case, but rather it refers to the suit in cards. Well of course it does! Garden spades never even occurred to me. Maybe if I were one to ever lift a spade (turn a spade? heft a spade?) I would think of gardening. But no, say in spades to me and I think cards, and Daniel Craig, and well, there I go again. By the way, while researching this word I came across this site, Luck in Spades. She’s a costumer who designs some interesting and elegant (and some very odd) costumes. Thank you to Dahlila for inspiration. Hope you have a better day today! I really think it means you want to go gambling.